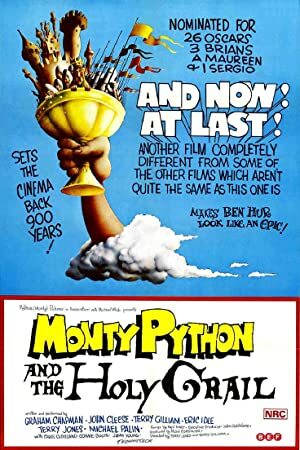 Monty Python and the Holy Grail (1975) – What's New on Netflix Canada Today! King Arthur and his Knights of the Round Table embark on a surreal, low-budget search for the Holy Grail, encountering many, very silly obstacles. History is turned on its comic head when, in 10th century England, King Arthur travels the countryside to find knights who will join him at the Round Table in Camelot. Gathering up the men is a tale in itself but after a bit of a party at Camelot, many decide to leave only to be stopped by God who sends them on a quest: to find the Holy Grail. After a series of individual adventures, the knights are reunited but must face a wizard named Tim, killer rabbits and lessons in the use of holy hand grenades. Their quest comes to an end however when the police intervene – just what you would expect in a Monty Python movie.